In the previous post, ‘Make it easy to enter health data’, we’ve discussed UX best practice and recommendations to facilitate tracking of one’s health data. Naturally, data entry is only the first step to achieve a specific health goal. This can be better management of a chronic disease, improving overall activity levels, specific health goal like weight loss or simply keeping yourself accountable. This is where the meaningful display of health data can help people gain insight and aid in achieving health goals. In this article, we’ll discuss 6 guidelines for designing user-friendly displays of health data. In the next article (coming soon!) we’ll have a look at a real-life example of recently redesigned Fitbit.com dashboard. Firstly, let’s define what dashboards are and look at the specifics of dashboards for self-managing health. This brings me to the most important question you should ask before diving into designing your health data dashboard: does your app/website/software need a dashboard? Dashboards are visually attractive and they became a popular pattern whenever there is any sort of data involved. This lead to over-use of this pattern in places where other, more meaningful and user-friendly, patterns could be used. Is the user dealing with a large amount of data coming from disparate sources? Dashboards for health self-management are somewhat unusual as the user is dealing with their own data. Dashboards originated in the environments like business or engineering, where tracked data is originally unknown to the consumer, therefore they need this useful overview. 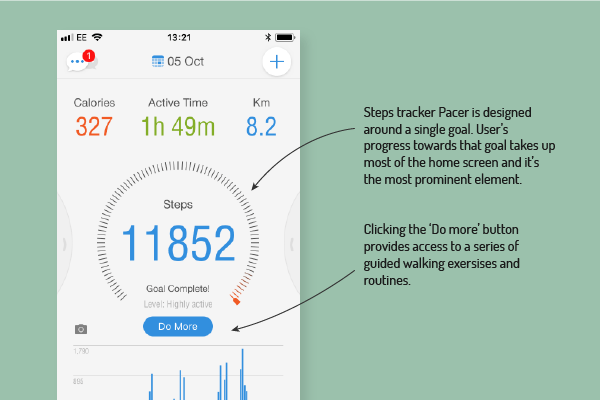 In the quantified self and self-tracking movements, a user is both the generator and the consumer of the data. This makes it more important than ever to think about the data display in a more strategic and careful way. As an example, a user would know whether they’ve been physically active as they simply know that they went for a walk that day. They might not know though, that the recommended guidelines in 10,000 steps per day and of course they won’t know exactly how many steps they did in a day. When determining the scope and need for a dashboard it’s useful to think about what is the new piece of information we can provide to the user (the exact amount of steps) and the insight user will get (how they do against the recommended daily amount). 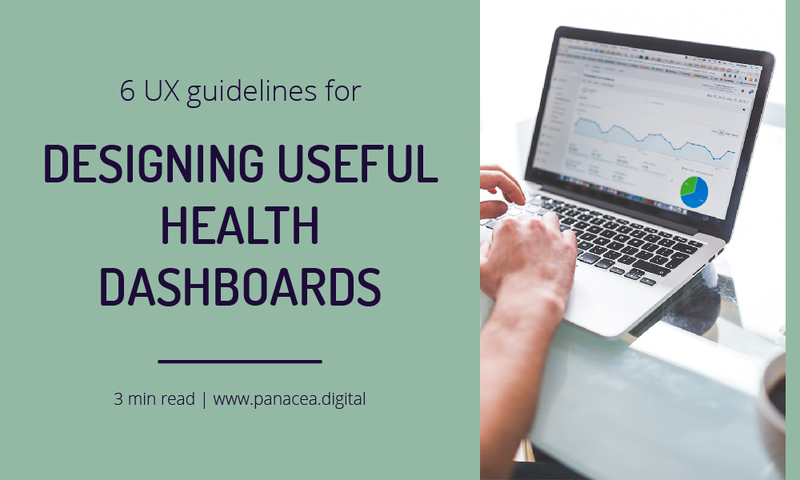 Now that you determined whether you need a dashboard, let’s look at the design principles for user-friendly health dashboards. Doing your research and understanding what is your users’ goal will help you prioritise what metrics to display and how you arrange them. The first glance at the dashboard should allow the user answer the key question they came for. Avoid mixing different user goals and questions in one view to remove clutter and ambiguity. Remember, a dashboard is a functional tool, not a display of technical capabilities. The fact that you can display a metric doesn’t mean it’s useful to the user at that first view. This aspect is very well described in ‘The Big Book of Dashboards’ where the authors present different types of dashboards based the most common user scenarios (user goals). 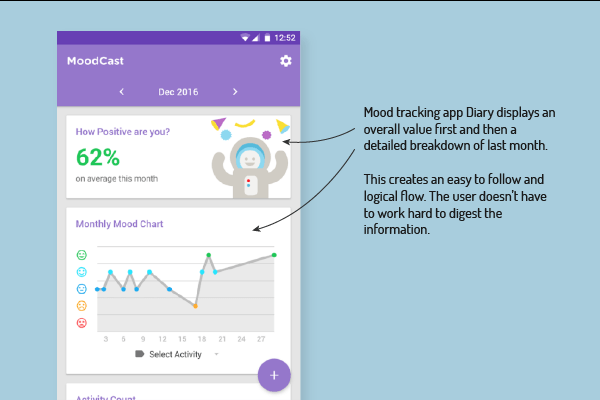 As most personal health dashboards associated with self-tracking movement are meant to help people reach their health goals, it’s always useful to give users some point of reference to assess their personal metrics against. The reference point will add an additional layer of context and help with arriving at useful conclusions. This could be based on users’ personal goal, recommended guideline by a healthcare authority (e.g. BMI index), or a benchmark against other users (it can sometimes add a useful level of motivation and competitiveness but a caveat is that ‘average’ doesn’t always equal ‘healthy’). As dashboards by their nature are heavily loaded with data and information, the visual design should avoid excessive decoration and use any visual elements, such as colour, in a meaningful way. Colour can be used to distinguish between different categories of information or to draw users’ attention to the specific data point (e.g. highlighting anomalies or important metrics). The red and green colours are often used to denominate positive and negative values but it’s worth bearing in mind that these are the colours that are most problematic for colourblind users. They should never be used as the only denominator of meaning and should be combined with labels or icons, or a colourblind-friendly palette of blue and orange should be used. Users should be able to use most of their cognitive capacity to understand the actual data. They shouldn’t have to work hard to figure out the interface or the graphs, as this adds additional strain on their cognitive capacity and distracts them from what they actually came for. 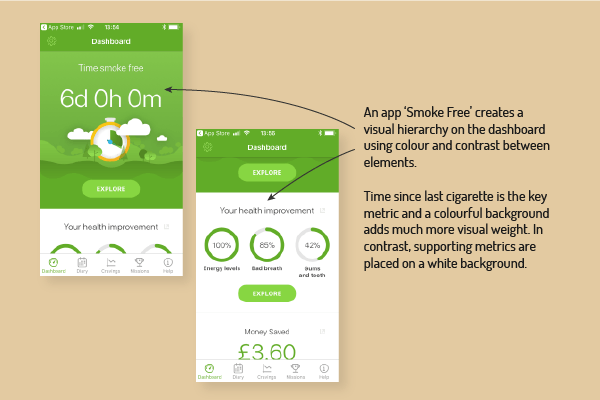 That’s why it is so important to use standard visualisation methods as users will most likely be familiar with them. There has been a lot of studies already made into how people process visual information and there are great resources available that can give guidance on using correct visualisation method. There is no point reinventing the wheel and causing the user to work harder than it is necessary. Grouping data widgets in logical groups will give a user a sense of structure and reinforce the information architecture. It will also help users easily scan the page and find the part they are most interested in. It’s important to think about the flow of the page. Interface design can be a little bit like storytelling. By designing the right layout and information groups you can guide the user down the path you designed for them. Where will they look fist? Where will their eyes go next? You can group your data widgets by similarity e.g. by type of data. You also want to distinguish summary from breakdown. You can also start with the current stats and then move on to the more detailed view of last week or month. The type of grouping and flow you chose will depend on user goal and context, but providing a structure is always better than just throwing loads of data and hoping the user will make sense if it. We’ve already mentioned you should use colour in a meaningful way to draw users’ attention to specific points of data or distinguish between categories. You should also use visual elements to reinforce the structure and flow you established for your whole dashboard. People are drawn to the elements that carry the most visual weight. People also (at least in western cultures) read from left to right and from top to bottom. By using the right placement, size and contrast of the elements of your dashboard, you can establish a sense of importance and hierarchy. This will aid the user in understanding what is the most important information and how different information groups relate to one another. As we’ve mentioned at the beginning of the article, one of the key characteristics of a dashboard is to enable the user to achieve an objective. Sometimes this will mean taking a specific step or action towards achieving that objective. Consider helping the user by displaying contextual advice. Fitbit gives users helpful tips on how to improve sleep quality displayed below their sleep graphs. If there is a relevant action user can take within your app or website to get closer to their goal, you can display that call to action next to the relevant data point. Designing useful dashboards isn’t an easy task. Knowing your users’ goals and learning about how people process visual information is crucial if you want to create a dashboard that is more than pretty graphs and a bunch of data. How does this advice work in practice? Stay tuned for the Part 2 of this article where we’ll have a look at recently redesigned Fitbit.com dashboard and see how those guidelines work in real life. 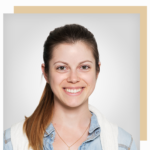 Marta is a UX designer and researcher, and the founder of Panacea Digital. After designing digital experiences and researching user needs for global companies like Sage, MasterCard or The Co-operative Group, Marta founded Panacea Digital to help healthcare startups understand their users and design digital products they'll want, love and use. Panacea Digital helps healthcare startups understand their users and design digital products that they’ll want, use and love.